We did several informal try outs with more than satisfying results, but to organize a formal public event in a quarry is not easy because of safety and logistics. Once we initiated and co-produced a very ambitious and successful theatre production: the Divina Commedia 2.0. See below for an impression. More information is on the page divina commedia details. 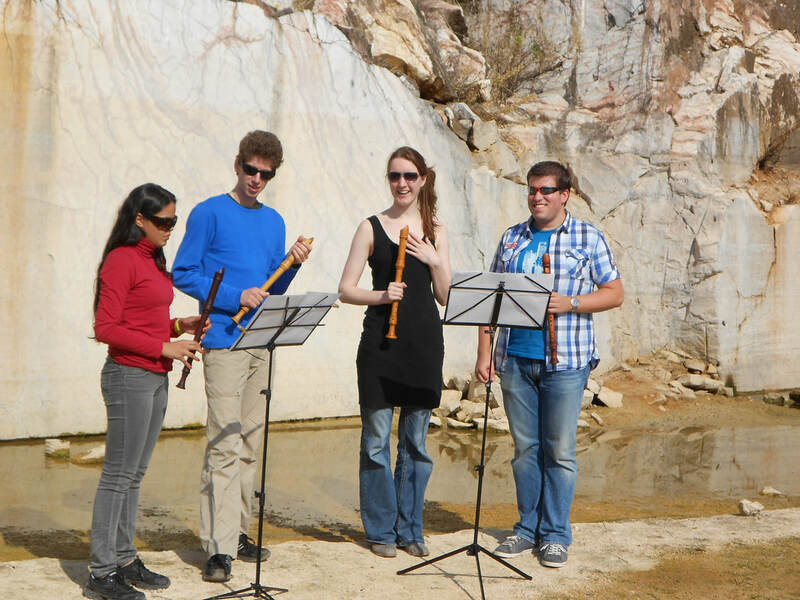 Students of Margo Kalse (Holland) did sing to experience the unique acoustics, as did the students of António Carrilho (Portugal) in his Master class recorder. Rob Monaghan (Ireland) made an impressive video of an as impressive performance by Phyllis Olwande (Denmark). The video has been presented as part of a land art installation in Ireland. The slideshow gives an impression, the video will later be published by the artists. 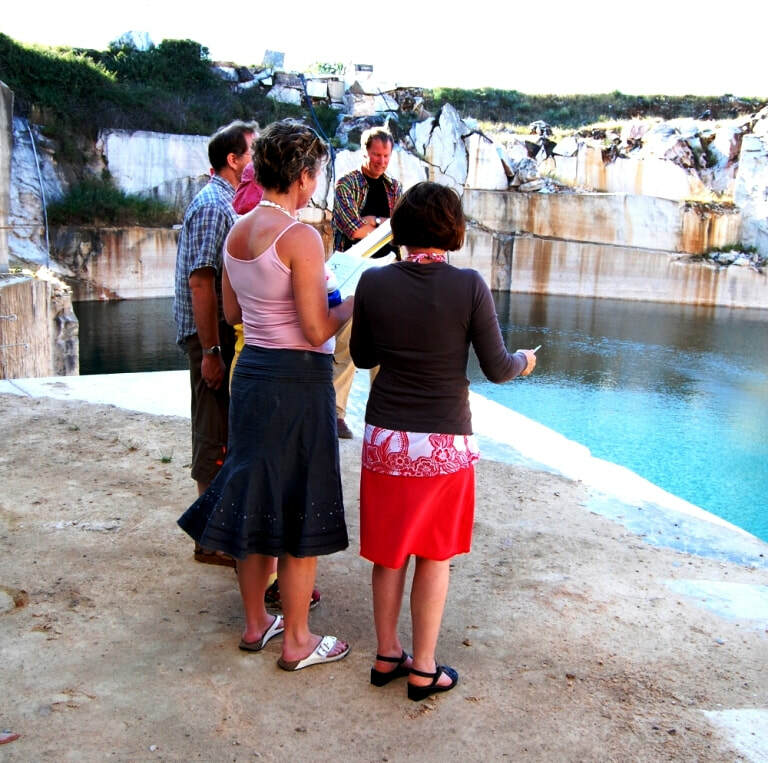 The artist’s couple Dan and Trish Scott realized a series of projects, assuming that the abandoned marble quarries were no the result of recent industrial activities, by are the remains of temples of an ancient civilization. They collected artefacts that they feel support their hypothesis, reconstructed instruments, wrote a scientific essay under the pseudonym of Dr Rosa Ramm, and gave at the end of their residency a press conference to present their findings. Dan Scott studied the acoustics of the quarries and concluded that this civilization must have used marble xylophones for communication and leisure. He reconstructed one. See this video. At the end of their residency Dan and Trish Scott gave a press conference of their findings in Évora. Foundation OBRAS promised the artists to make a book in small edition, in which their project is summarized. The promise still stands but realization is delayed for financial reasons. Melina Peña (Mexico) and Nuno Veiga (Portugal) recorded on the foot of a marble waste pile a performance with butoh dance elements. Some video stills are below. Jee Won Kim (South Korea) made a choreography for a dance and danced that piece herself in a quarry, partly accompanied by by António Pliz on violin.